Veg manchurian/Vegetable Manchurain is a classic Indo Chinese recipe. It is easy to make and tastes very good. 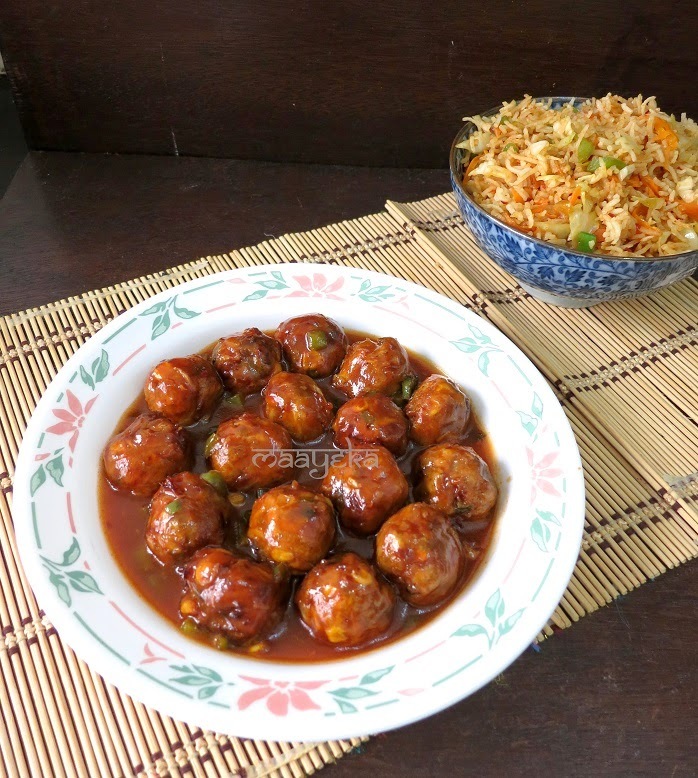 There are quite a few versions of making the manchurian balls and the sweet and sour sauce is also made according to individual taste. Chopped, grated or minced vegetables are mixed with cornflour or bread crumbs and salt, pepper and soy sauce are added as seasoning and then the balls are deep fried and added to the sweet and sour sauce. 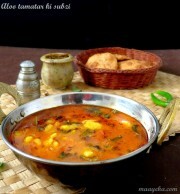 You can also make the balls in a paniyaram pan for a low fat version. It can also be made as a dry manchurian (without sauce), or semi dry the way I have made here, or wet (with sauce). 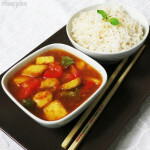 Enjoy the sweet and sour vegetable manchurian with chinese fried rice, hakka noodles or even with any Indian bread. Take all the ingredients listed in to make manchurian balls(except cooking oil) in a big bowl. Mix all together, but don’t mash with pressure otherwise vegetables will start releasing water. Heat oil in a pan and check by frying a ball first, and if it is breaking then add some cornflour or bread crumbs in the vegetable mixture. Add balls first on high flame and then reduce flame to medium heat and fry few at a time. Avoiding crowding the pan. Fry balls to a nice golden colour and then drain on a paper napkin. In a bowl add corn flour and 1/2 cup water, mix well and keep aside. Heat oil in a wok and add chopped or slit green chilies and ginger. Saute for a few seconds, then add chopped capsicum and stir fry for few seconds. Now add chopped cabbage and saute for a minute. Add soy sauce,chili sauce and tomato sauce and stir for few seconds. Now add sugar, salt and pepper powder and boil for approx 1 minute. Add the water and corn flour slurry (made at step 1) and mix well. Boil for a minute and keep stirring till sauce starts to thicken. Now add the fried manchurian balls and vinegar and remove the pan from the flame. Serve hot with fried rice. 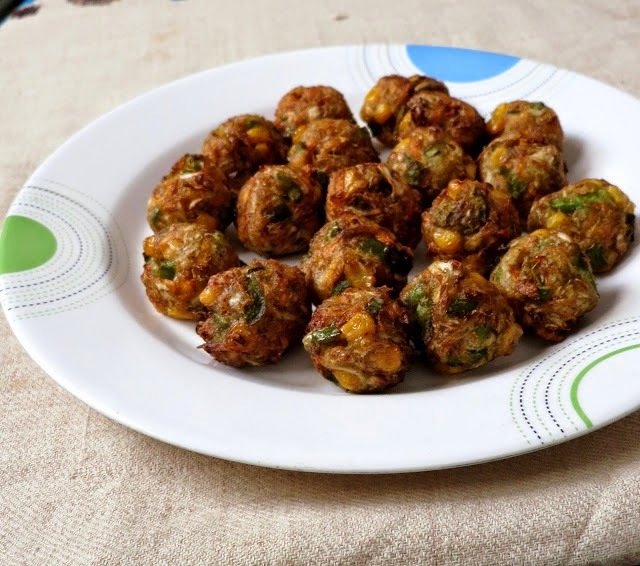 1- You can also make the manchurian balls in a paniyaram pan or lightly brush them with oil and bake in an oven. 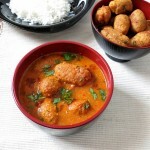 2- The fried manchurian balls can also be served as an appetizer. 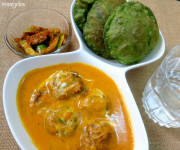 3- Keep the fried balls and sauce seperately and mix them only when you want to serve. 4- Boiled potato, boiled and mashed rice, corn flour or bread crumbs can be added as a binding agent according to personal preference, I tried adding potato and loved it as balls are shaped and fried perfectly. 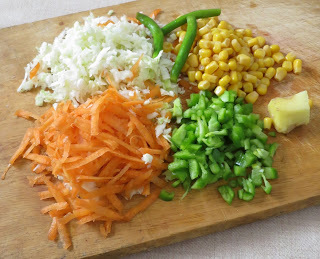 5- For making dry manchurian just skip the water and cornflour slurry. (step 1 and 8 in the sweet and sour sauce procedure) and follow the rest of the recipe. 6- Make the manchurian mixture only when you are ready to fry. If the mixture rests for long it will start releasing water and become difficult to shape so you may need to add a lot more corn flour to bind. 7- You can adjust the consistency of sauce according to your preference by adjusting the quantity of water and corn starch.but do remember that the sauce will thicken further when it comes to room temperature. 8-You can finely chop the veggies in a food processor but I like to have some amount of crunch in the balls so I grated and chopped them. 9-Addition of corn is optional. The roundup of the Virtual Eid Potluck Party is now ready on my blog. Please accept the token of appreciation for joining the event. I'm a big fan of Indo-Chinese cuisine and Manchurian is one of my favourites. Thanks for linking it to my Virtual Eid Potluck Party. One of my all time favourite Chinese dishes. Lovely recipe. This would also be great for my Virtual Eid Potluck Party. It would be great if you could link it to my event.